In The Other Typist Suzanne Rindell takes the reader on a journey deep into the recesses of the mind of the main character, Rose Baker. As Ms. Rindell leads us through the twists and turns of this story, the question of Rose’s reality begins to unfold like an origami bird—neatly designed to look like one thing, but clearly taking another shape as the story moves along. Set in the 1920s, Rose Baker is introduced as a rather nondescript female who does stenography for a local police precinct. The work can best be described as mundane. Not a job that any self-respecting man would do; the three typists are all female and treated with deference as the “delicate gender” by the males in the office. Rose’s feelings for the two men most in charge are best described as a “crush” on the Sergeant and a distant dislike for the Lieutenant Detective. These men weave in and out of her thoughts as the story moves forward, but relationships never culminate into anything more than opinions in her mind. Odalie introduces Rose to an entirely new way of life—a way so different from Rose’s upbringing in an orphanage and an education clearly designed to keep Rose tied to a stenography machine for her entire working life. Through Odalie Rose meets an odd collection of shady characters such as Redmond, the Dwarf, and Gib, Odalie’s erstwhile fiancé; and the pace of the story quickly gathers steam as Odalie manipulates Rose (or does she? ), dragging her into the dark labyrinth of bathtub gin, prohibition, and speakeasies. The story unfolds to open deep secrets, outrageous shenanigans, and a frightening murder—each item cleverly designed to draw attention to both Odalie and Rose, and the ever-tightening friendship they have forged. The Other Typist is written in the first person, and the use of dialogue is sparse, giving the reader the sense of living in Rose’s mind and seeing the world through Rose’s eyes. It is not until the story has totally grabbed the reader, who is now unable to put the book down, that one begins to wonder about the clarity of Rose’s thoughts. Living in Rose’s mind has clearly formed our opinions of Rose and those around her, and then suddenly the reader comes to realize there is still so much more to come and one can only ask if Rose is true, or a sham. Ms. Rindell’s description of people, places, and things paints a picture as clear as crystal, as in this scene where she describes entering a ‘blind:’ “The whole room was warm and humid with bodies, and the sharp tang of fermented juniper (from my time at the precinct I already knew very well this was the signature scent of bathtub gin) hung in the air.” The author’s use of the five senses, peppered throughout the story, draws us in, allowing us to experience the events first hand. Obsession is clearly the prism through which this story is viewed, but with the turning of each page, the question emerges…who is the obsessed and who is the obsessor. Ms. Rindell takes us by the hand and walks us through this hall of mirrors, dropping clues and foreshadowing events to come until we arrive at the startling end of the story. A cagey turn of events, to be sure. 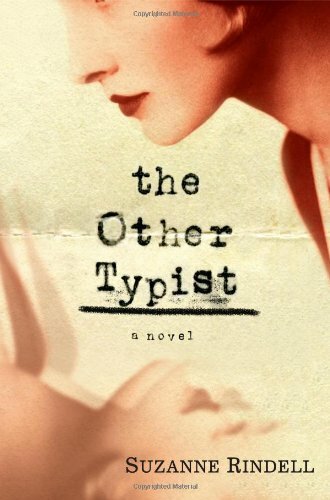 The Other Typist is sure to be one of the year’s best books, and it screams for a place on the shelf!